Lori Lightfoot’s identity is being celebrated. But activists warn about her politics. After besting Cook County Board President Toni Preckwinkle in Tuesday’s runoff election, Lori Lightfoot became both the first Black woman and openly gay person to lead the Windy City. The victory represented a major milestone for the mainstream LGBTQ+ community, but a contingent of young Black queer and trans activists are concerned about the direction she will steer Chicago. For organizers like Bonsu, the critique starts with Lightfoot’s professional track record. 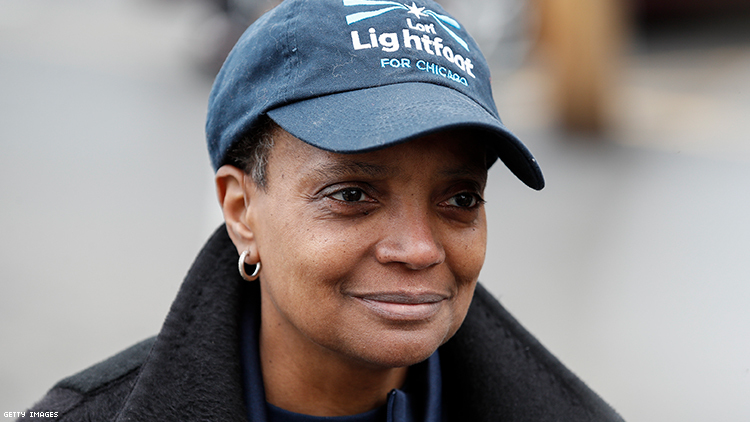 Despite having a campaign that’s positioned her as an outsider to the noted Chicago political machine, Lightfoot’s government connections run pretty deep. Before graduating from the University of Chicago Law School in 1989, she worked as a legislative aide in the offices of Ohio Congressman Ralph Regula (R) and Maryland Congresswoman Barbara Mikulski (D). Later, she served a year-long stint as clerk for Justice Charles Levin of the Michigan Supreme Court. For much of the 56-year-old’s career, she has worked as a lawyer (regularly described as a “wealthy, corporate” one by her opponent on the runoff campaign trail). But the sticking points of the organizers’ contention in Lightfoot’s history has been her roles within the local criminal justice system. In the early 2000s, she was chief administrator of the Chicago Police Department’s Office of Professional Standards, regularly defending the department against external critique. During her OPS post and, even in private practice, there were a slew of cases in which she represented the city or police and appeared to oppose alleged victims of police violence and mistreatment, like Christina Eilman, who was abducted and gravely injured after being released from police custody during a mental health crisis in 2006, and Robert Washington, who was fatally shot by Officer Phyllis Clinkscales in 2007. It was Lightfoot’s perceived inaction after the shooting death of 22-year-old Rekia Boyd by off-duty police detective Dante Servin in 2012 that is at the forefront of many of the #StopLightfoot campaigners’ minds. After being appointed as president of the Chicago Police Board by outgoing Chicago Mayor Rahm Emanuel in 2015, she oversaw decisions on incidents involving allegations of police misconduct. The lead-up to her appointment saw Servin charged with involuntary manslaughter in 2013 and being cleared of charges by Judge Dennis Porter. While many called for him to be fired from the police force, he was allowed to stay on, eventually resigning just days before a hearing to decide on his fate. During the height of the Movement for Black Lives, Lightfoot was seen as not doing enough to acknowledge the concerns of many of the young Black activists leading Chicago organizing efforts against police brutality. In line with this critique, community members were outraged after Lightfoot presented a solution for police training at a mayoral forum hosted by the University of Chicago’s Institute of Politics. She stated: “We have 38 schools that are vacant from school closings, some of which can be repurposed to help us with our training needs.” The remark came during a week when organizers interrupted a city council vote on Emanuel’s police and fire academy proposal to no avail. The city’s aldermen voted approved the contract, 38-8. Not only did her response dig into the already growing fear about her criminal justice reform strategies falling short, but it leaned into a sore spot for Chicagoans: the widespread 2013 school closures which disproportionately affected Black youth. Described online as “a group of young Black, Brown, Native, white queer, Trans and gender-nonconforming organizers and people who love Chicago, and have worked for years on issues of police violence, immigrant justice, LGBTQ liberation, and more,” the #StopLightfoot campaign emerged when Lightfoot’s popularity in the mayoral contest increased throughout late 2018 and strengthened during the 2019 run-off election. Hart claims it’s a direct outgrowth of the youth-led No Cop Academy campaign, which began in 2017 in response to Mayor Emanuel’s controversial proposal to build a $95 million police and fire training academy. It currently boasts support from more than 100 organizations. Throughout early 2019, #Stop Lightfoot organizers spearheaded several actions including train takeovers and showing up at her rallies. Efforts reached a fever pitch on March 21, the seventh anniversary of Boyd’s death, when organizers infiltrated an event where she was speaking to demand answers for the disconnect between her professed values during the campaign and the ones they have grown to know so intimately in their organizing throughout the years prior. In the last week of the election, United Working Families, an independent political organization, released a series of videos questioning Lightfoot’s progressive values and showcasing some of the actions organized in protest of her run for mayor. However, despite all of the opposition to Lightfoot’s run, she handily defeated her opponent with 73.69 percent of the vote. In the last months, Preckwinkle’s appeal to the majority of voters declined. She was mired in struggles throughout her campaign: awkwardly bringing up Lightfoot’s queerness in a debate, never forcefully denouncing the homophobia Lightfoot faced from some detractors, ending TV ads weeks before the election, and most of all, not positioning herself as an outsider to the local political machine. This left organizers bereft of a stronger alternative for voters. For what can be described as a small version of the 2016 election all over again for young progressive Black queer and trans organizers, they plan to continue to demand action from Lightfoot on the endless list of community concerns. For Bonsu, who has come into leadership at BYP 100 with D’atra Jackson within the last six months, the organizing work will continue regardless of who’s at Chicago’s helm.